We understand firsthand how daunting amputation can be. New Hope has remained a regional leader in prosthetics because of our dedication to providing patients with the best prosthetics care. Our clinicians and practitioners will walk you through every step of the amputation and recovery process. A prosthetic is an artificial device to replace or supplement a missing or impaired part of the body. These devices are made of the same materials found in our military’s fighter jets. They contain titanium, carbon matrix, acrylic laminations, micromotors, and can be computer controlled. All of this technology is custom engineered for each patient’s needs; no two are exactly the same. By spending the extra time to truly “personalize” each device, we offer our patients the maximum potential for both a physical as well as emotional recovery. What are the reasons someone might have to amputate? Amputations happen for a lot of different reasons. Traumatic accidents that damage a limb beyond repair, life-threatening infections, birth defects, nerve damage, and vascular limb diseases can all cause a patient to need an amputation. We get this question a lot, and the short answer is most likely! 90% of our patients are able to walk after being fitted for a prosthesis. Every patient is different, and it greatly depends on your age, overall health, where the amputation is located on the body, and a patient’s individual dedication to recovery. Prosthetics have come a long way, and they offer a patient almost infinite possibilities for regaining their mobility. What’s the process for getting fitted for a prosthesis? An important part of what we do comes down to our devices. When a patient comes in, we get to know them, talk to them about their goals, their quality of life, their interests and passions… all so we can get them the best fit for what they need. Every assessment is hands-on and personalized for the patient, and each device is crafted by hand. Technology has come a long way, and we utilize those advancements when it’s in the best interest for the patient, but we also know that feeling the residual limb with our hands, getting a sense of where the tender areas are going to be, where ligaments and muscle and bone are all situated on each individual… that’s the best way to give them a long-lasting fit that doesn’t cause complications or issues. Having a prosthetic is not the same as having your original limb. While prosthesis technology and biomechanics have come a long way, there are certain things amputees have to consider. Your limitations will be based on your recovery process and the type of device you have. Limitations for a mid-thigh amputee are going to be very different than those of a below-the-knee amputee. Talk to your prosthetist before your amputation surgery to discuss how you can eliminate as many limitations as possible. Does insurance cover my device? Prosthetics are covered under major medical, meaning almost all patients get their device covered by insurance. It's very rare for a device to not be covered. Give us a call to talk about whether your device would be covered under your current insurance plan. Will I only need one prosthetic device? Odds are, you’ll need more than one prosthetic throughout the rest of your life. Some people use different devices to accomplish different tasks such as riding a bike or lifting weights or participating in some sports. Another reason why you may need more than one device is because of adjustments to your residual limb as you get older. The fit of your socket has to remain snug, and over time, your residual limb will change volume and shape. Adjustments and new fittings for your device are common. 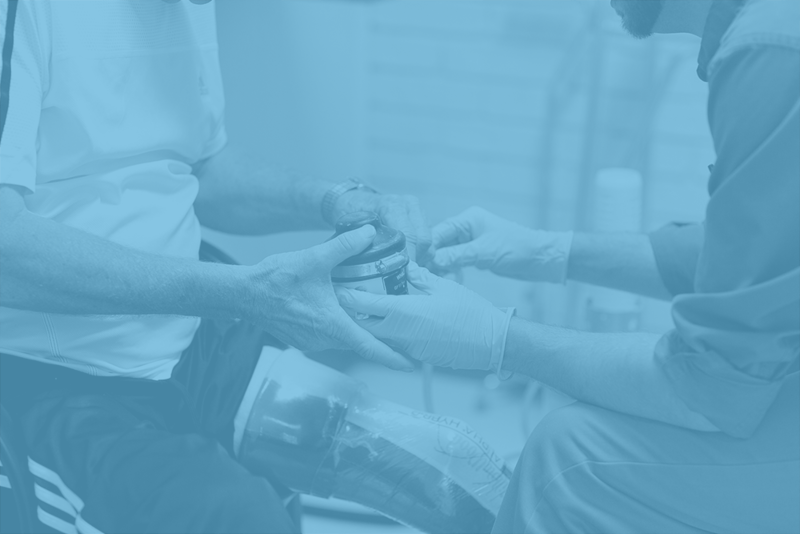 Check out our full guide to the amputation process to take an in-depth look at every step of the journey to getting fitted for a prosthesis!